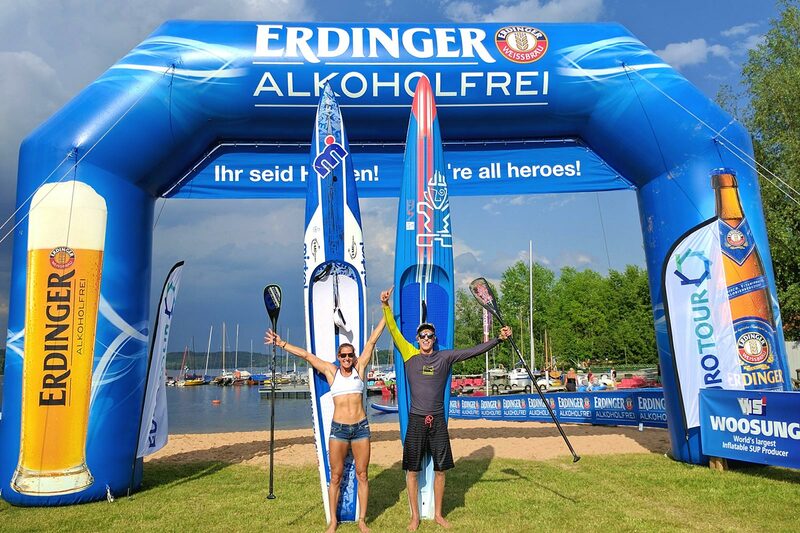 Starboard’s Connor Baxter and Mistral’s Seychelle Hattingh have claimed the “Fastest Paddler On Earth” time trial event here on Day 1 of the Lost Mills event in Germany, out-sprinting an all-star field to claim early bragging rights ahead of tomorrow’s main event, the 18km distance race. Others to impress included Boris Jinvresse, Jake Jensen, Noa Hopper, Manca Notar and Amandine Chazot. Connor, the 2013 champion in this 200m time trial specialty race, saved the best for last. Literally. As the fastest qualifier into the 25-man final, Connor was the last paddler to clock a time this afternoon, and the Hawaiian needed every last stroke to haul in the pace set by Boris the ultra dark horse Frenchman. But as we’ve seen so many times before, Connor produced the speed when it mattered most to cross the line in 0:53.12 — 58 hundredths of a second clear. In a sign of just how tight the competition was today, Australia’s Michael Booth – the hero of St. Maxime just five days ago – could only manage the 20th fastest time of the day, as the dark horses of Europe stood up to be counted. And standing up taller than any other European was Boris, a relative newcomer to the European circuit and a complete unknown on the international scene. Boris produced the fastest time of the day with his run, however the Frenchman had a nervous wait as five more paddlers had a chance to upstage him. One by one they failed, with Aussie Jake Jensen falling just 23 hundredths of a second short, until along came Connor. It was also an impressive performance from young Noa Hopper, who only arrived here in Germany last night after several flight delays and without any luggage whatsoever (thanks United). Clearly unphased by the jetlag (and the fact he had to borrow a pair of boardshorts just to compete), Noa put in a stellar run to briefly hold the lead, before eventually being over-run by Boris, Jake and Connor. Noa, one of California’s finest young prospects, paddles for the 404 team and was actually using the winning board from the 2014 edition of this event, where 404 founder Danny Ching set the “Fastest Paddler” record of 47 seconds — a record that will stand for at least another year. Earlier in the afternoon, Seychelle claimed the fastest time in the women’s final, impressively crossing the laser-timed finish line in 1:02:50, which was more than two seconds clear of runner-up Manca Notar. The battle continues here in Bavaria tomorrow, with the showcase event of the Lost Mills, the 18km distance race, beginning at 2pm local time. And we’ll have our Starboard Live Stream up and running for the entire race on Saturday. You can watch the big Lost Mills race LIVE on Saturday, right over there on the SUP Racer Facebook page. This will hopefully give you a good insight into what is set to be one of the most competitive races of the year. And as a little bonus, here’s the final run from Connor. The video below shows the world number one taking an incredible 91 strokes in the space of just 53 seconds, which equals a cadence of 103 strokes-per-minute; Or in other words: Almost two strokes per second. A note about points… The 2016 Fastest Paddler On Earth race counted for 20% on the SUP Racer World Rankings. I was planning to remove the “Fastest Paddler” from the rankings completely, however I only made the decision last minute (literally) and didn’t notify everyone, which wasn’t fair to the paddlers that only entered the race chasing points (which was quite a few athletes). Up until the week of the race, the Fastest Paddler was listed as being part of the world rankings at a 2-star level, so I decided a compromise would be to lock it in as a set 20% race, rather than either delete it or let it fluctuate upwards. It’s also probably not fair to drop a race that counted for a decent amount of points last year. So basically, the “Fastest Paddler” race is basically being ‘phased out’ — next year it won’t count at all. “Sideshow” events can be great for spectators and for race format experimentation, but they shouldn’t take away from the main event. So from now on* it’ll be: One event. One result. One champion. Personally I’d like to see that extended to become “One event. One race. One Result. One Champion.” — I’m not a big fan of how events such as the Pacific Paddle Games, the Gorge and the World Series combine two totally different races into one result, as I believe it penalises the specialist paddlers. But until those events get more focused, this is the compromise. At the Lost Mills in 2017, the Fastest Paddler will still be a standalone event with its own prizes and bragging rights, but most of the prestige (and all the points) will be on the main event. I don’t want to discourage events from running exhibition style sprint races — I actually think more events should so that we can experiment with more exciting types of racing — but I would like to see more focus on having one champion at each event.